Anyway, I'd love any advice you have! Thanks! Hi Olivia! My post must not have been clear; you can't get an "abono normal" if you're under 23 though -- so you won't have to decide between the two. 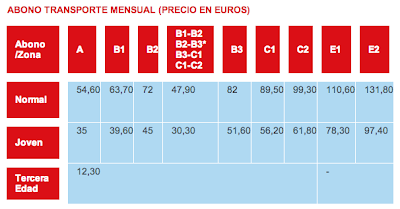 You can only apply for one abono, depending on your age: joven, normal, or tercera edad. After you make that distinction, you can choose the area you want it to be valid (A, B1, B2, etc.). So, had I been older than 23 when I applied for an abono in 2011, I would have applied for an "abono normal" and waited the same amount of time. I don't remember exactly how long it took, but my abono was there within 15 days -- earlier, I think. I went back after about a week, which I recommend. The first time it wasn't done yet, but the second time it was there. So definitely apply for the abono joven as soon as you get there. Use 10-trip passes in the meantime, but also don't forget to take into consideration the time of the month that you arrive. (i.e. if you get your abono and there's only a week left in the month, wait until the next month to start using it because it will be cheaper to use the 10-pass tickets for a week). Don't worry if you don't finish a 10-pass ticket, because at some point in the year it will come in handy (maybe you'll have a visitor or be out of town so much in December or a summer month that it won't make sense to buy the month's pass). I hope you have a wonderful time in Madrid! Feel free to email with any more questions! Hi! Thanks for your quick response. :) That makes a lot of sense. I've known about abonos joven/normal for awhile now, but I didn't think they checked your age for the normal. 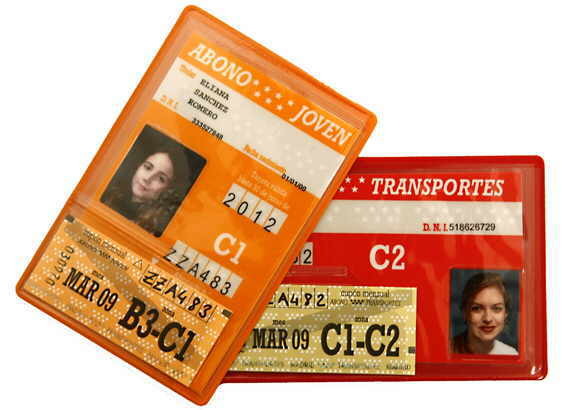 (I studied abroad in Alicante and you could get a regular bus pass without showing any identification, but you had to submit a photo ID/photo for your joven pass. I'm not surprised things are different in Madrid!) Your tip about the time of the month is really smart, too. I'll keep that in mind when I head over there. I'm a new auxiliar, so I definitely might be back with more preguntas. You're very welcome! Glad it's helpful! Feel free to email if you have any questions—I hope you'll enjoy Madrid as much as I did!